I love desks. It’s one of my favorite pieces of furniture. I had one as a kid growing up and have had many since then. I remember going to the used office furniture store to pick it out. It was a huge, solid wood desk that I had throughout childhood and high school. I loved that desk. I still love desks… and currently have 2 desks and 2 tables in my home office. This gallery shares our enthusiasm for desks of every conceivable stripe for all types of home offices (see our epic photo gallery of home offices featuring over 150 amazing home office designs). Our hope is that this detailed guide can act as a primer for those looking to purchase a new desk for the home or office. Desks are the best single piece of furniture for work and play, the office and home. A great desk can be the centerpiece of any space dedicated to a specific activity, whether it be a hobby, schoolwork, a job, or simply having fun. One of the most singularly varied pieces of furniture anyone can own, the options you’ll encounter when purchasing a desk are limitless. We’d like to help break down the varieties of style, function, and form to help you seek out the perfect desk for your life. Desk construction comprises a wide variety of categories, crossing a spectrum from the more traditional, sprawling wood models to high tech, minimalist steel and glass designs. 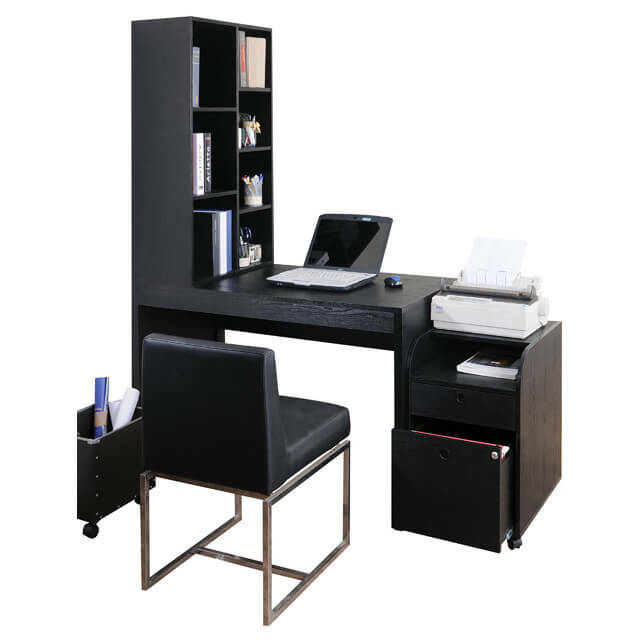 Each category focuses on a specific range of utilization, including writing, computer, secretary, credenza, and executive desks. Each style, material, and finish grants a unique touch to the room it is housed in, so choosing the right model involves appraising the looks and function equally. Desks are classified in a wildly varying spread of categories. From slim, minimalist pieces to office-filling sprawls, the category of desk you choose will define the room it stands in. These are minimalist, open desks with minimal storage and a large desktop. 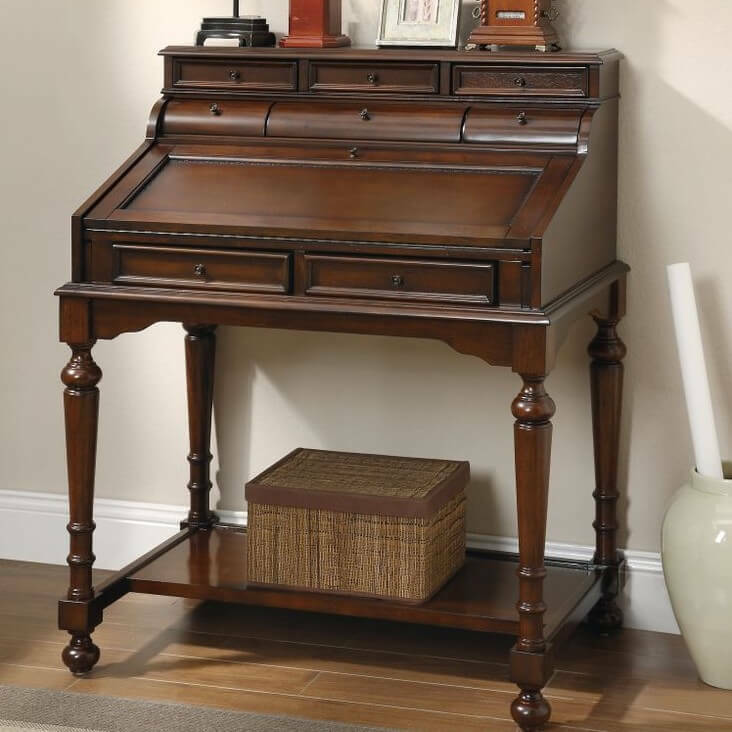 Writing desks are perfect for placing along a wall or in the middle of a home office floor. This design is better suited for a laptop than a desktop computer for office work. The direct, conservative styling works elegantly in nearly any space. 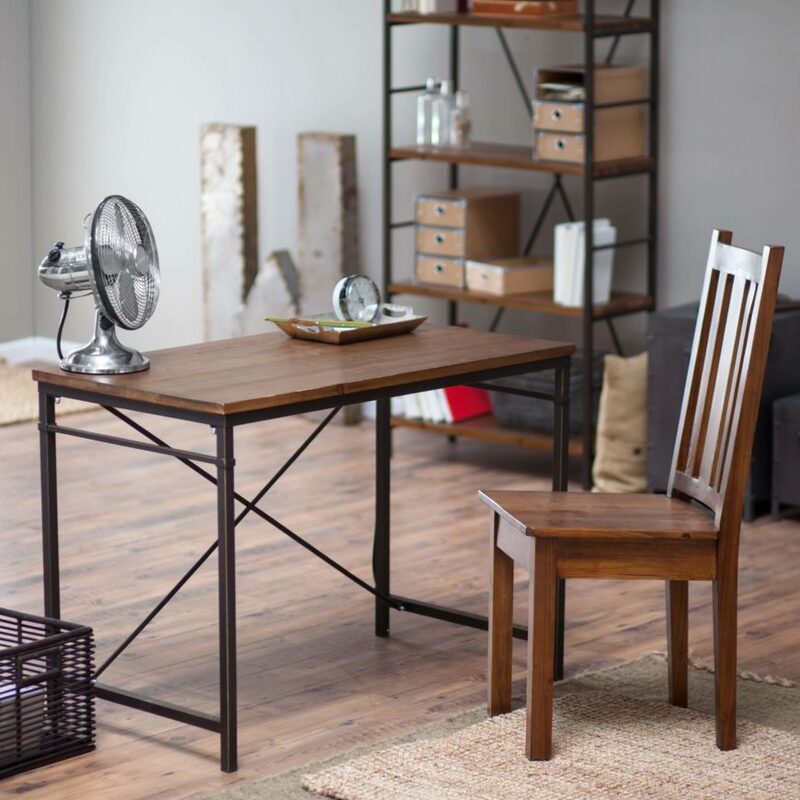 Check out our collection of small home office desks here. In a modern home office setting, computer desks are the most practical and utilitarian of all home office desks. These provide plenty of space for both a computer tower and monitor, as well as storage for any computer accessories, cables, and peripherals you may need. 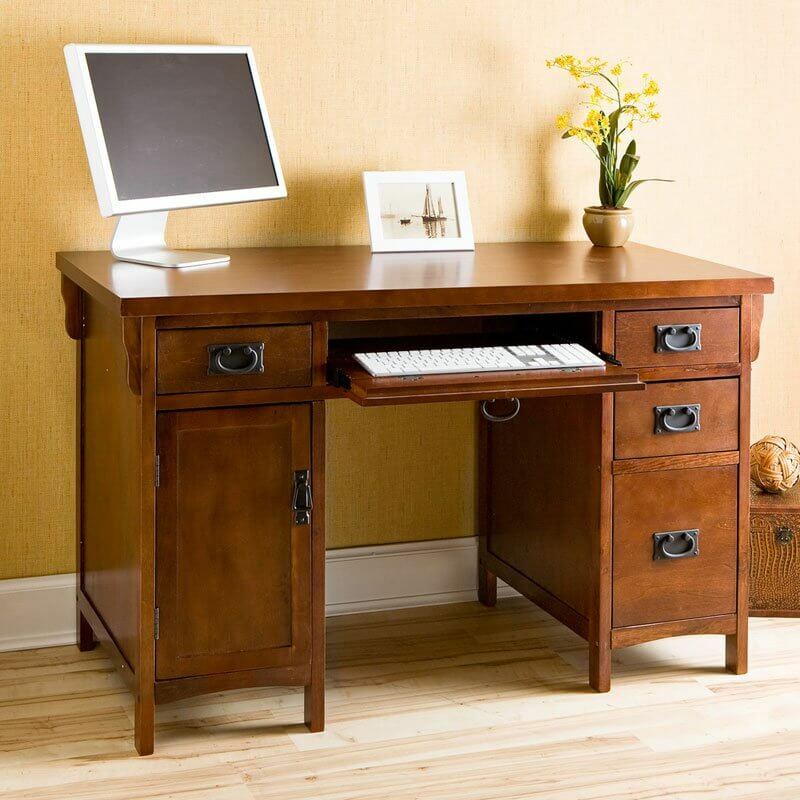 Like the writing desk, this is built for efficiency and simplicity, but with added space for hardware components. Key elements include a keyboard tray and large storage area for the CPU. That said, more and more people no longer have large desktop computers and instead opt for laptops and tablets since they have more than enough computing power to manage everything digitally. This potentially renders the computer desk obsolete since you don’t need the typically computer desk features such as keyboard tray and CPU storage section. Nevertheless, you may still want a computer desk for your home. Here’s an example followed by a large gallery of many different types of computer desks. 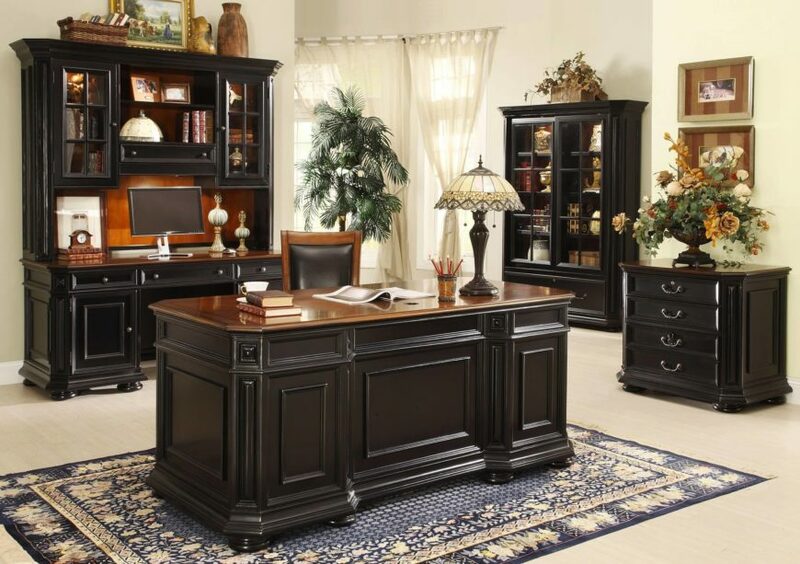 The executive desk is the king of the home office world. With loads of drawer storage and surface area, along with an often massive footprint, these carved wood specimens impart a sense of grandeur and timeless appeal that stands apart from other styles. Credenza desks, as the name implies, combine a desk with a cupboard-packed credenza. This is a piece of furniture normally reserved for dining or living rooms, valued for its fashion and utility. When combined with a desk, you gain the benefits of both pieces of furniture, so long as you have the space to hold one. Corner desks can be a convenient solution to space problems in their compact iteration, or a sprawling suite of surface area in their more elaborate configurations. They can provide more desktop space in a smaller area, or a large L-shaped spread, depending on the size you’re aiming for. The best aspect is their ability to provide extra leg room. This is a type of desk topped by a hinged desktop surface, which is in turn topped by a bookcase, usually closed with doors or drawers. The whole is usually a single, tall and heavy piece of ornate furniture. 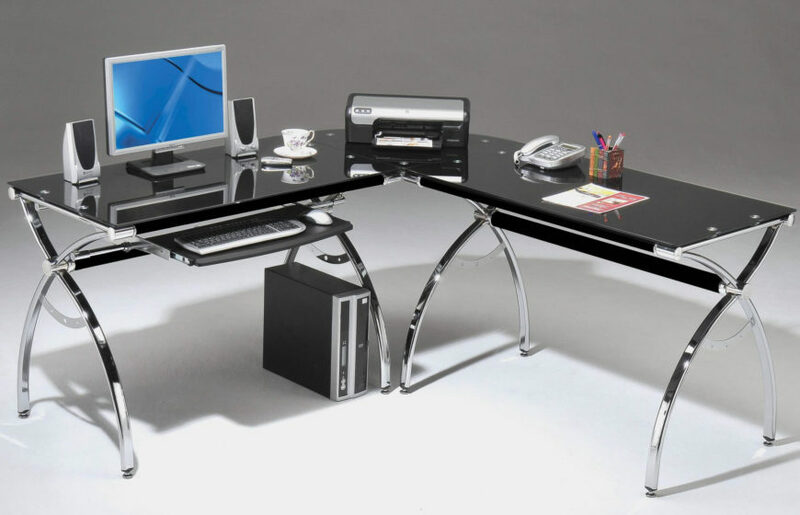 There were originally for people who wanted a luxurious desk yet lacked the room for a formal roll-top model. 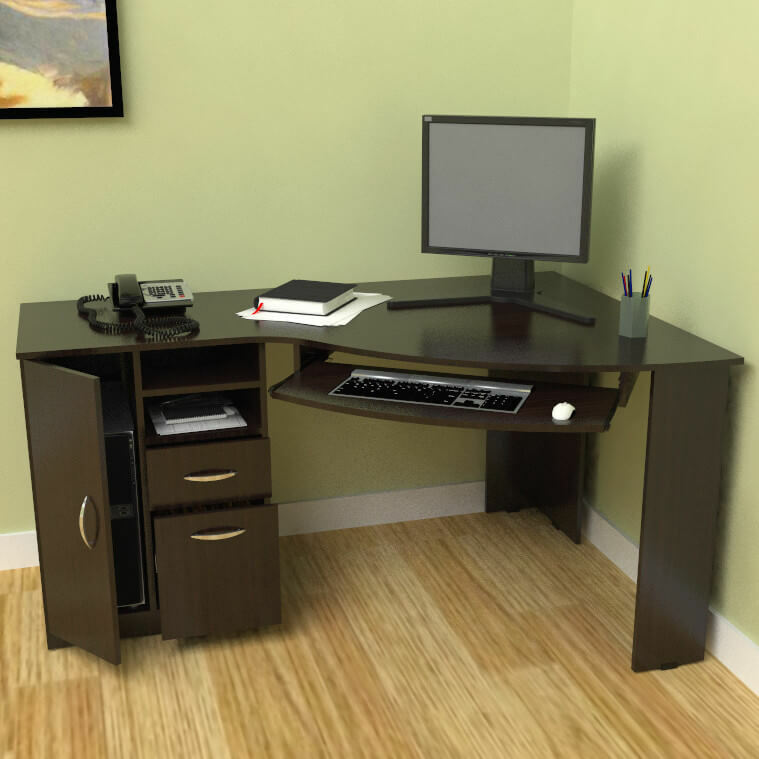 This type of desk is mounted directly onto a wall, completely saving all available floor space. 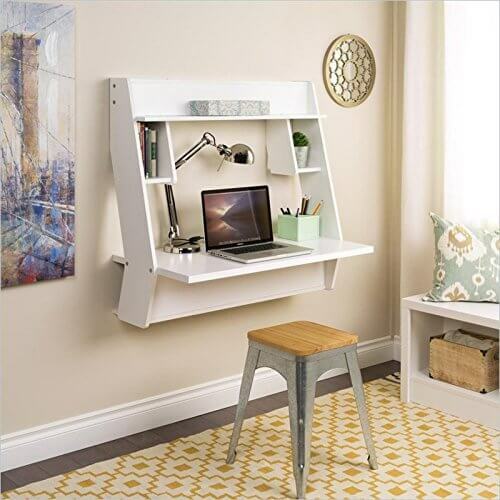 Often mounted with shelving and cubbies, taking advantage of the vertical frame, these desks are incredibly useful for those with limited space. The floating desk is perfect for dorms or bedrooms. Growing up my parents had a spectacular antique roll-top desk in they living room they had bought at some old antique store and refinished. However, you don’t have to buy an antique one; you can still buy them new as well. A roll-top desk is one where a hood rolls down over the desk surface to secure all contents. 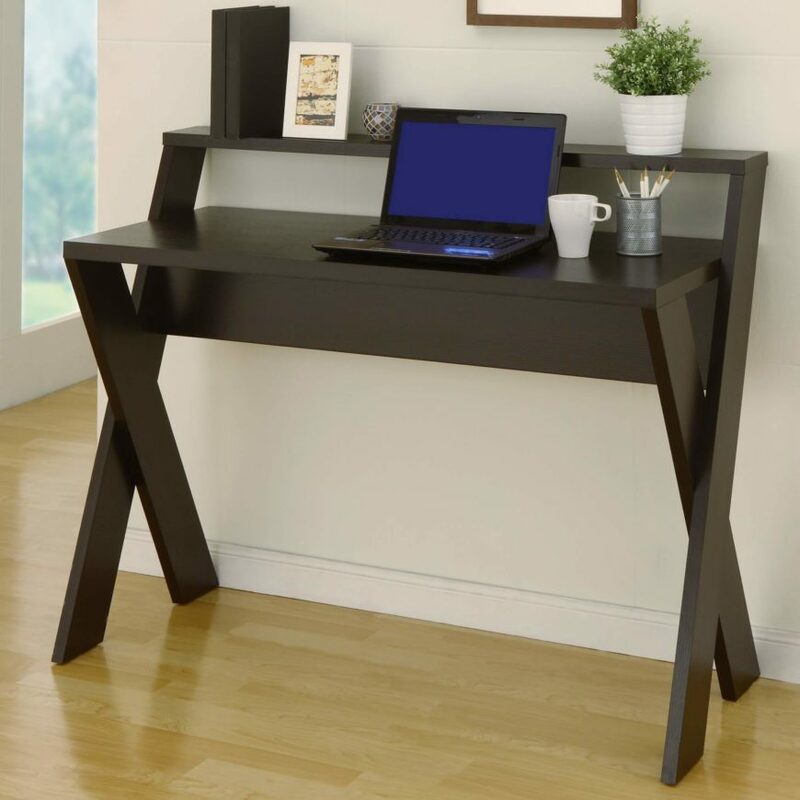 While not the most practical desk, especially for computing, it can be a beautiful piece of furniture in any office, living room or master bedroom. Drawers on the right side. In recent years, there’s been a lot of health discussions around how unhealthy it is to sit for extended periods of time. The result is the growth in the popularity of stand-up desks due to the purported health benefits of working part of the time at a stand-up desk. Entire desks that can be raised and lowered. Static stand up desks that are always in an elevated position. Stand-up desk accessory that turns regular desk into a stand-up desk. While the above gallery showcases different types of standing desks, my favorite are the motorized Herman Miller adjustable standing desks (but they cost a lot of money). The desktop itself is where you’ll make contact with the desk, and where the vast majority of interaction with the furniture occurs. Whether concealing storage below or acting as a simple table top, the material determines most how the desk looks and feels while it’s being used. 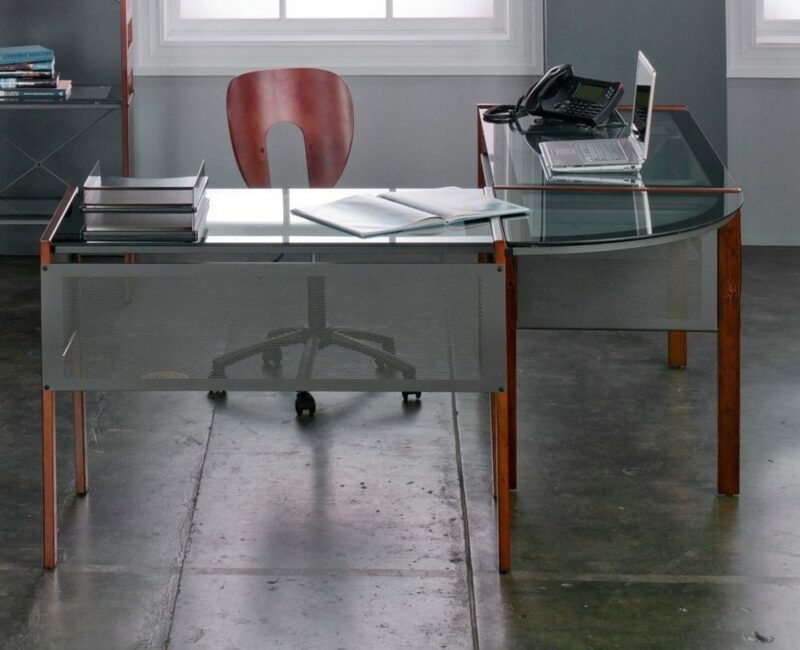 Glass surfaces add a boldly modern touch to any desk. Paired with wood or metal construction, the glass expands visual space and lightens the entire piece of furniture. Often removable for cleaning, maintenance, or moving purposes, glass desktops can be found in a variety of shapes and configurations. A metal desktop is the ultimate in utilitarian design. 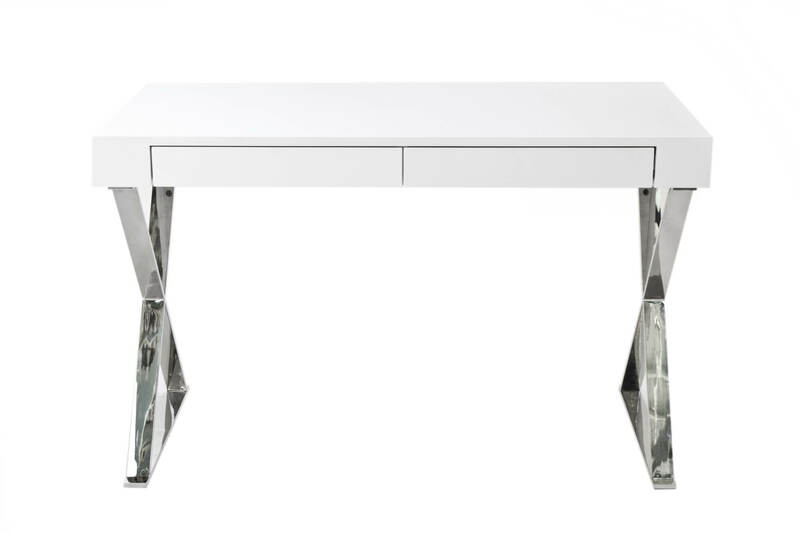 Resisting stains and scuffs, and remaining cool to the touch, it’s another modern material that’s often paired with a modern design desk, like glass. 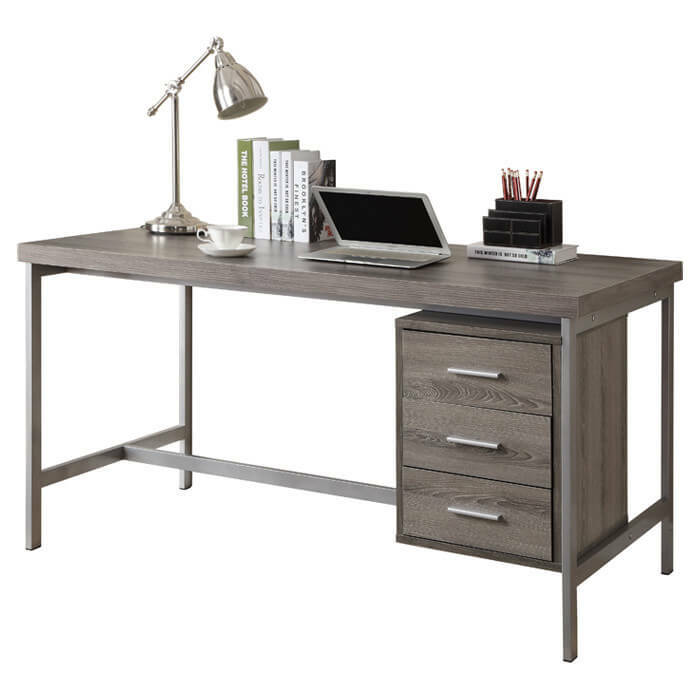 As you can see, metal desktops can be paired for a high contrast look with traditional wood constructed desks. Laminate surfaces overlay a protective material on top of the wood construction. This coating is usually plastic of some sort, meant to keep the desk stain and warping resistant. These are not the most luxurious desktops, but they provide practicality, versatility, and peace of mind. As the most common desk construction material, wood models come in a range of finishes, with the most popular being natural, white, black, and grey. The natural wood tone, whether stained lighter or darker, is by far the most common desk finish available. With a classic look that conveys timelessness, it’s no wonder these have remained popular to this day. White finishes have gained in popularity recently. Adding a bright, sparkling tone to any room, a large swath of white can open up any space. 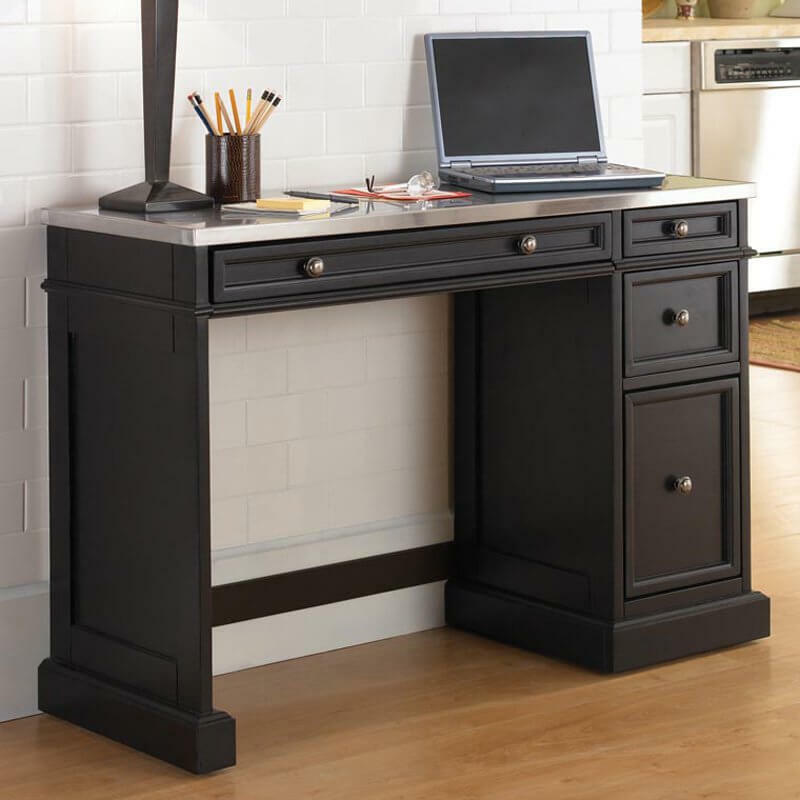 A black desk holds a slightly more modern tone than traditional natural wood styles, yet retains a more stately, serious look. Metal frame desks often come in black as well. Grey wood finishes impart a calm, neutral tone, with a modern edge. Less warm and traditional than natural wood, yet brighter and less serious than an all black model, they strike a fine balance.